← HBW 41: Ah!!! This is the homebrewer’s life. For this week’s Homebrew Wednesday I start off with a tasting of my Lion’s Roar pilsner (hence the title), giving you a detailed analysis of all aspects of the beer. I then announce the winner of my 300 subscriber contest aka Corey, The Iowa Carver and introduce the rough details about another contest that I’ll be running where the prize will be autographed copies of Charlie Papazian’s latest books (The Complete Joy of Homebrewing, 4th Edition and The Homebrewer’s Companion, 2nd Edition AND John Palmer’s Water book. Then for the second half of this week’s episode I show you some footage of me using “the poor man’s beer gun” to counter pressure fill both a 22oz and a 12oz bottle from one of my kegs. I hope that the demonstration is useful to all those who keg their beers. The Brewed Palate In The Kitchen Episode 3: Beer Braised Lamb Shanks. 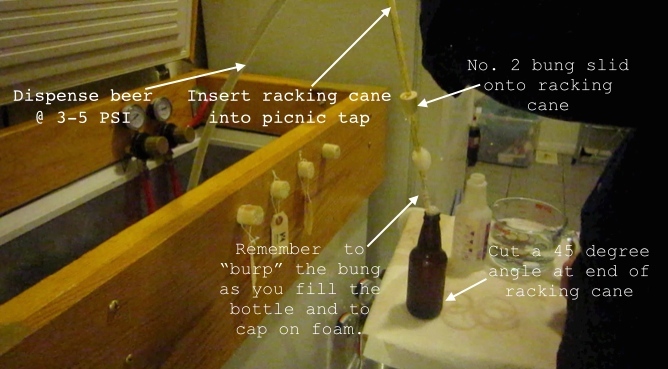 This entry was posted in Homebrewing, Pilsner and tagged bottling from keg, Charlie Papazian, homebrew wednesday, Lion's Roar Pilsner, Matt Brynildson, pivo pils, poor man's beer gun, The Complete Joy of Hombrewing. Bookmark the permalink.